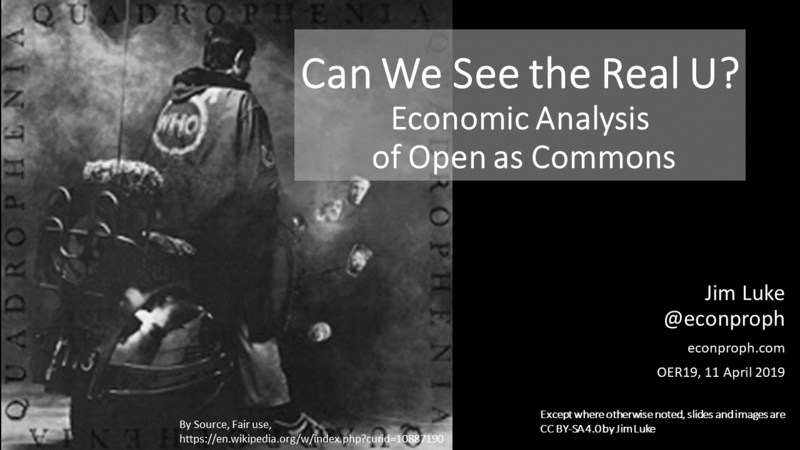 It’s been a couple days after the fact, but I wanted to make a post to go with my presentation at OER19. Fortunately, thanks to the nice folks at ALT and the magic of Martin Hawksey, I don’t have to try to write a long post explaining what I said and you don’t have to look at slides that don’t have many words on them and try to guess what I said! Now, if you weren’t there and haven’t seen it already, you can play along with the home game! Just point your browser to my wonderful page from the conference website. You can watch the whole thing! Nonetheless, I will be doing some blogging based on the presentation. Instead of doing my usual “oh I’ll just include the slides and give a brief post” that ends up being 4000 words, I’m going to do it different this time. I’m planning to write a series of posts – a post for each slide or two. The feedback I got at the conference tells me not only that more but shorter posts is better, but more importantly, people want to hear more depth on some of the individual concepts on the posts. For example, judging by my discussions afterwards the one line I have in there about “a commons doesn’t scale, it scopes” is worthy of post all its own. So stay tuned. Writing that series of posts should be useful for me too. I’m excited and gratified by the feedback I got at the conference that has encouraged me to research and write more about the academy-as-commons. I thought maybe I could bring some new perspective to the idea of commons since I’m not only an economist, but I’ve also had a whole other career in business strategy & consulting and I’ve been heavily involved in higher education governance & accreditation. The conference confirmed that. So I’m committing to writing this stuff and continuing the research and exploration. I know there’s a book somewhere here and who knows what else coming. I’m excited about it. I’m also very interested in any thoughts you have on the topic feel free to comment or message me. Finally, if you’re interested having the slides themselves, you can download my slide deck from my Dropbox. Remember, #CommonsIsAVerb and let’s #ReclaimTheAcademy.